I've been watching the Tour de France the last couple of weeks. You know, that four week race of doped-up bicyclists? Just kidding. It's a fascinating sport. Charges of performance enhancing drugs notwithstanding. I don't quite understand the strategy of the teams and why they sometimes work together and sometimes not but I just love watching these guys as they glide through the French countryside. 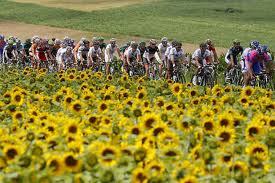 And that's the first thing you notice about the tour coverage - the gorgeous countryside. The mountains, the valleys, the old towns, the historic buildings, churches and castles - the tour is a travelogue sure to entice tourists. But the other thing you notice is the fans. Some of these people are so dedicated it borders on insanity. As the cyclists hit towns with narrow roads, or climb hills with equally narrow patches of pavement, these fans pack each side of the route and crowd in leaving the bikers even less room to cycle by. Some fans take a step or two out and clap their hands and shout at the cyclists. Others decide to run along beside the bicycles waving their arms. Others pat the riders on the back. The other day some guy ran along beside the bikes waving a smoke flare. It makes me think that these people must be tossing back a bottle of vino or two under the hot sun while they're waiting for the peloton to pass them by. I mean some of these folks must be drunk to do some of the things they do. The worst, though, occurred yesterday. Some guy, for reasons unknown, thought it would be a fun idea to toss tacks onto the road. The result of this stupidity? 48 punctures to bicycle tires, 3 camera motorcycles out of the race due to flats, and of course the result of yesterday's stage was tossed on it's head because many of those leading at the time were affected by this insanity. Now I know people can get pretty excited by sports. Football, baseball, hockey playoffs are one example. Soccer perhaps provides us with the worst example of fan behaviour. 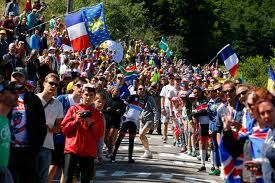 But when television commentators start referring to Tour de France fans as hooligans you know all is not right with the world. Little do they know, but the French have just given us another reason to endear themselves with the rest of the world. Not. Hooligan is too nice of a word. Ya think? Whoever would have expected such a thing from bicycle race fans. It's just so weird. Some people are unbelievable! What kind of damaged mind would want to totally ruin other people's chances in a big race like this, after a year of preparation? I know. I guess you could say they weren't very tackful. I try to stay cutting edge. But you know the French will always be all right by me...as long as they keep sending us those delicious fries. Wait. They're NOT made in France? Hey I'm married to one. Although she's French from Quebec not French from France and they're responsible for poutine!!! I heard about that... while it did demonstrate the lowest form of humanity, it also demonstrated the highest. One of the teams slowed down to allow one of the cyclists to catch back up to where he was before the carpet tacks took out his tire. It's quite an experience to sit back and take in the fantastic photography, especially from the helicopters, as the riders race through the gorgeous French countryside. 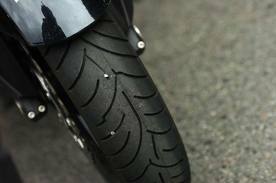 But this tack thing really ticked me off. I have a friend who loves cycling. I totally don't get it. I will say it might be fun to go watch it live as I think it would be fun for photographs. Oh I think it would be great for photographs. But I'm with you. I'd rather be a spectator than a participant.